Siemens’ new £30m train maintenance depot for First TransPennine Express has been officially opened by new transport secretary, Douglas Alexander MP. The depot, at Ardwick in Manchester, will look after First TransPennine’s new fleet of class 185 trains that were introduced late last year. 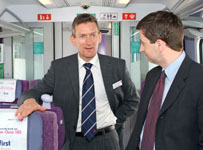 All 51 of the new German built, three carriage trains will be on the network by early 2007. Facilities at the depot, built on previously derelict land, include a new wheel lathe, bogie drop, train wash and fuelling area. A second depot at York is due for completion later this year. The Ardwick depot is a joint initiative between Siemens, First TransPennine Express, the government, and HSBC Rail.